Archery Warz is the Archery equivalent of Paintball and involves elements of Dodgeball and Laser Tag. 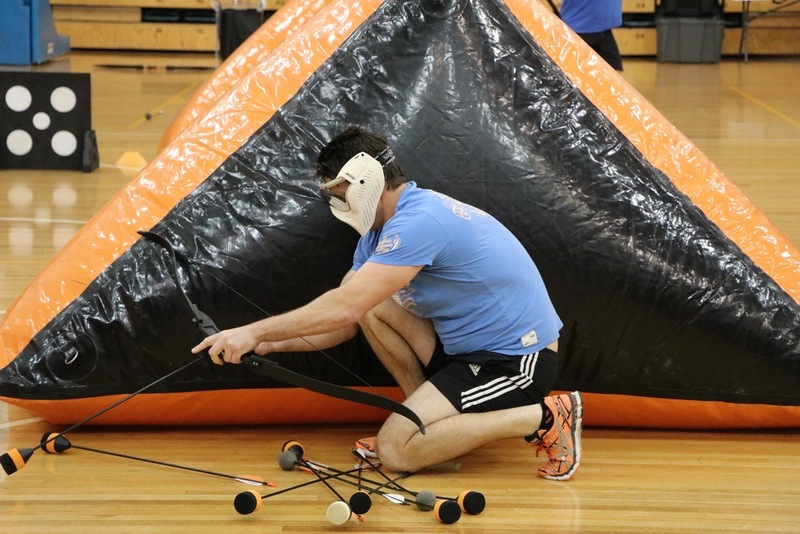 We provide an inflatable battlefield and all playing equipment, including full paintball mask, real recurve bows, target spots and foam tipped 'LARP' safety arrows. We operate a fully mobile service from Melbourne, Canberra, Gold Coast, Perth and surrounding regional areas. We can help you source a location or you can use some of the previous locations we have used around town! Some examples of ideal Archery Warz locations are tennis courts, open parks/ovals, reserves, indoor sports courts, function rooms, and convention centres. The equipment and games are easy to use and our events are suitable for beginners to advanced archers. Throughout the course of your event we will run you through lots of fun game modes including Elimination, Team Death Match, Infection, Last Runner Standing and more. We have equipment that caters to teenagers through adults, The impact of the arrows is less painful than paintball, but still enough of an impact to get your adrenaline flowing while playing. Our live action archery sessions are brought to you by the team at Bubble Soccer 2u and Parties 2u. Our friendly staff and referees are there to help you every step of the way with your events and sessions. You can also choose to combine your event with some of our other services including Bubble Soccer, Nerf Wars, Laser Tag, Soccer Billiards (Foot Pool), Soccer Darts and more. We can run Archery Warz in any location of about 25mx20m, indoors, outdoors or even your backyard. Thank you for your enquiry. We will send you through a quote shortly. Any more information about your event or questions that you might have. Thank you for your enquiry. We will get back to you witha quote shortly. Bookings are available any time and on any day. We are generally available to take your calls between 10am and 8pm each day.